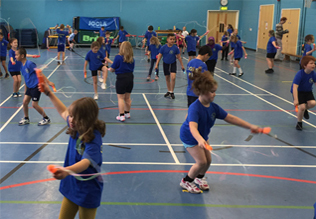 At Skip2Bfit we promote skipping as a great and easy way to keep fit and active. If your company is looking for a way of promoting fitness to your staff that come and talk to us. Our workshops can fit in with your requirements and office space. In our workshops we see groups of staff for 30 minutes sessions. We talk about fitness and motivation and show people how to skip, showing the method taught to boxers. We then ask them to take the two minute skip2Bfit challenge. Many people remember skipping as a child, skipping for hours with friends, singing songs etc. We just ask them to skip for two minutes. The skip is all done to motivational music using our own skip2Bfit CD which as 25 tracks of music, all timed exactly for two minutes with 1 minute, 30 second and 10 second voice-overs on it. This shows people how fit they are, with scores usually ranging from 100 to 300 skips in two minutes. Very often this is a shock to people who remember how easy it was when they were younger and it encourages them to take up skipping to help to improve their fitness levels. Skip2Bfit is also used as a motivational tool. By motivating poeple they often improve on their score. Staff can work in teams to find how who can get the top score, what team can improve the most etc. 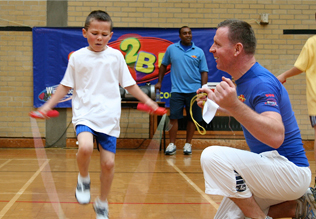 At Skip2Bfit we give a physical example of improvement showing staff that with effort and determination you can improve at your skipping and that this is the case with everything you do in life. The day is great fun, it helps to imrove self esteem, team building and overall staff fitness. 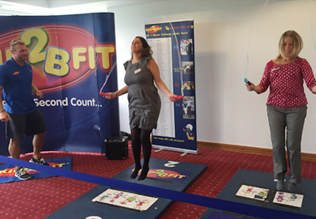 Skip2Bfit corporate days can also be part of your Health & Wellbeing Days. 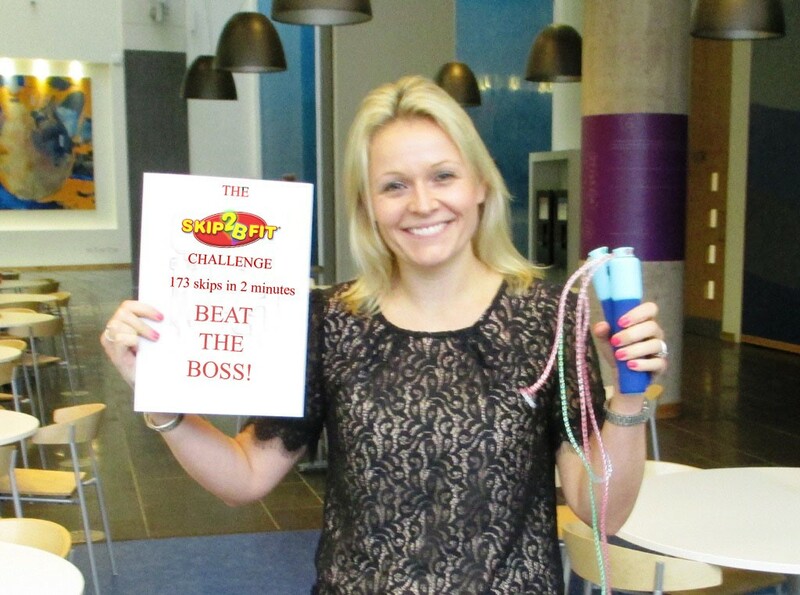 Giving employees an opportunity to take part in the Skip2Bfit 2 minute challenge. Why not give us a call on 01843 603020 or e-mail us to discuss your requirements.